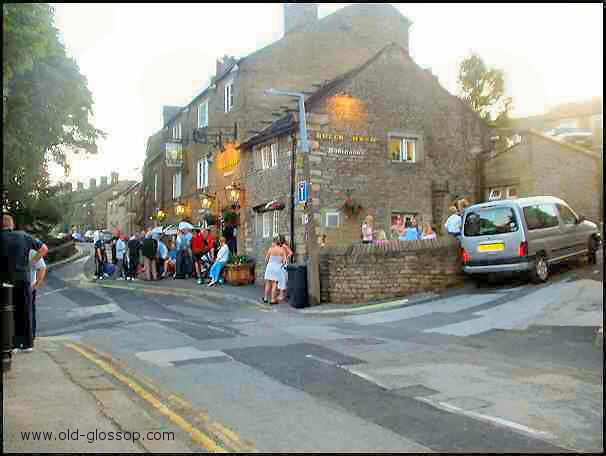 The Bulls Head is the oldest pub in Glossop and over the back door is a stone lintel which bears the date 1607, unfortunately covered over by a modern wooden verandah. The name of the inn has two possible origins. Some people think that it originates from a Papal Bull of the 13th Century requesting that provision should be made for travelers in every township or parish. Others would contest that it originated from the bull baiting which took place at the wakes on nearby Castle Hill. The stump to which the bull was tethered is supposed to be still in the ground but covered by road surfacing. In the bull baiting, the bull was fastened by a chain to the stump and the dogs set at it. The winner was the dog that held on the longest against the infuriated bulls attempts to get rid of its tormentors. One of the first landlord's to be recorded was Edward Pickford who in 1801 shot 15 balls from a crossbow fired from the Bull's parlor window into the large window on the north side of the church. The court to hear his case was of course held in the Bull. The "Modern" Bulls Head has a fine restaurant in the newly converted dining rooms. The pub is a Robinson house and its very cool natural cellar helps to keep the bitter in fine fettle. Although well supported locally it boasts visitors from all over the world . The exact age of the Bulls Head is not known. The two storied part is certainly older than the three storied part and dates from around 1600. In the low roofed drinking rooms of the "old inn"it is not difficult to visualize these dark deeds of mankind. It could so easily have seen tragic and long forgotten incidents standing on the fringe of the treacherous moorland paths that 200 years ago would be more forbidding than today. The trustees of the turnpike road held some of their meetings at the Bulls Head. The ratepayers refreshed themselves after their vestry meetings and it was the headquarters for the " Female Friendly Society" which was instituted on the 8th of Oct 1798. The members of this society met on the second day of January unless it was on a Sunday, then the first Monday after the 25th March, June and Sept. at nine o'clock in the morning, all subscriptions had to be paid before 10:30 am. at which time a procession was formed and they marched to church. After listening to the sermon for which the vicar was allowed 1/2 a guinea and the clerk 2s. they went back to the Bulls Head and dinner was served at 1pm. Fines on members were levied by absence and the stewardess was compelled under a penalty of 5 s. to visit every sick person within a radius of three miles. 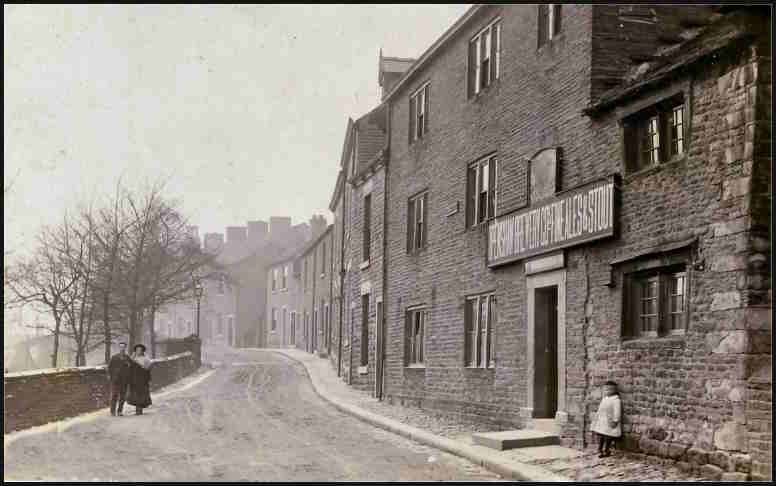 A Mrs Ester Pickford was still the landlady in 1825. A timetable of coach services for 1821 (before the small road was open) notes one between Glossop and Manchester, This was called the "Merry Tradesman" and left the Bulls Head on Tuesdays and Saturdays only at 6:30am. and arrived at Manchester at 11:30 am. The return journey started at 3:30 pm. and also took 5 hours. 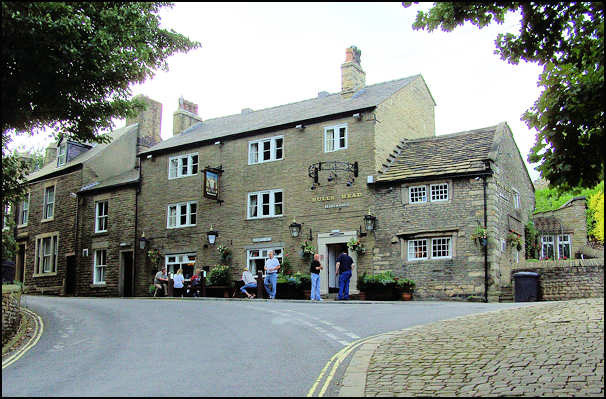 An old farm on Castle Hill was the coach house, The Bulls head was a place of some consequence as a hostelry providing accommodation for both men and beast when the only means of travel were either coach or horse back and in addition was the "Church Inn" for it supplied all the ale consumed by workmen at the church, when the provision of ale was customary at every job, and the wines used at the services. 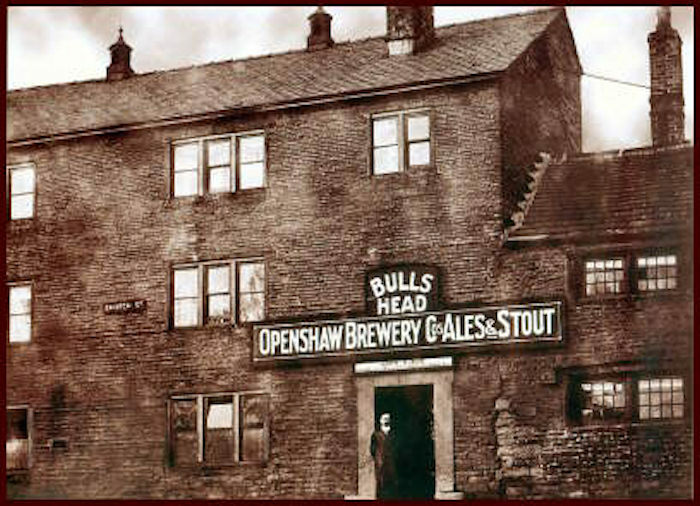 An old bill head of the Bulls Head contained the following items, eating, ale porter and tobacco, wines negus (a hot drink made of wine, water, sugar, nutmeg,and lemon juice). brandy rum gin, hay and corn beds outerboots, chambermaids, Obviously an important place of resort. The gaunt walls of the parish church face the Bulls Head making it seem tiny by comparison, but the old inn keeps its secrets.